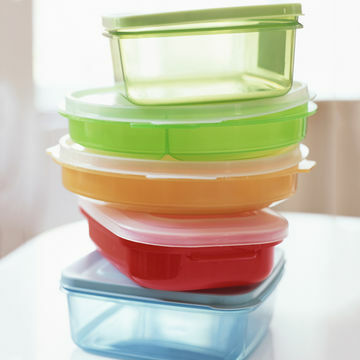 Be sure that raw meat doesn't spread its bacteria-laden juice to other items by securing them in a well-sealed container and using meat-only cutting boards and utensils. 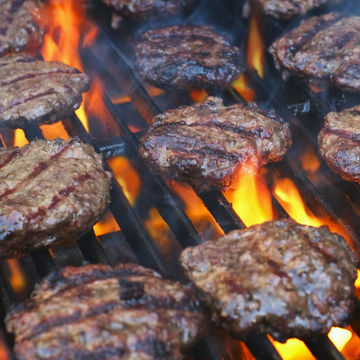 Exposing meat to the smoke and high heat of the grill can spur the formation of cancer-promoting heterocyclic amine compounds. Try cooking at lower temps, scrape off any charred bits (which harbor the harmful chemicals) or place meat on a perforated grill pan, which reduces contact between your burger and smoke or flame. Research shows that herbs and spices in marinades and rubs may also squelch heterocyclic amines. Probing meats with a digital instant-read thermometer is the best way to be sure you've bid adieu to bacteria that can cause food poisoning. 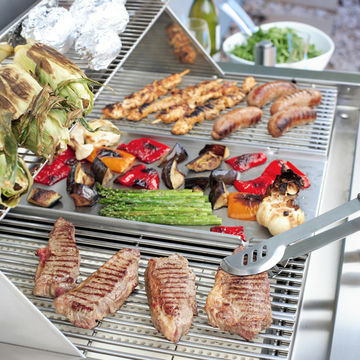 In general, grill poultry to an internal temperature of 165° F; ground beef and pork to 160° F; and pork chops and steaks to 145° F followed by a three minute rest before serving. 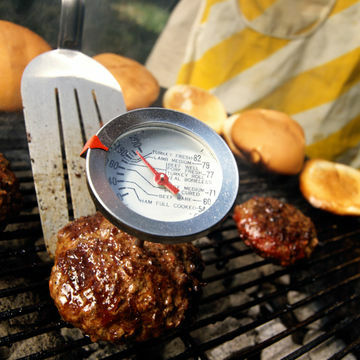 Hot foods such as burgers and chicken should stay at or above 140° F. To keep grilled food safe until you're ready to serve (without overcooking), move the items to a part of the grill rack that is not directly above the flame. Mayo-laced sides like pasta salad and slaw can cause food poisoning, particularly in sultry weather when harmful microbes tend to multiply quickly. 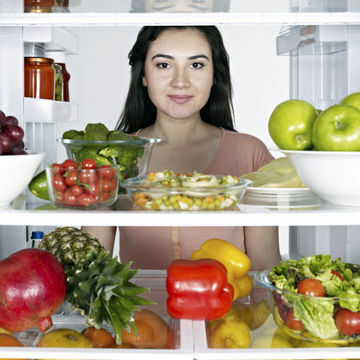 To prevent stomach woes, keep perishable cold foods in the fridge until serving time.